called Ma Crosbys. Well, not exactly. As far as I know it has never been named Ma Crosbys although affectionately called that by most people. The real name is just Crosbys. Everybody has heard the 80’s song by George Strait called ‘’Blame it on Mexico’’ that immortalized ‘’Ma’’ Crosbys Bar, Restaurant and Hotel in Ciudad Acuña, Coahuilla, Mexico. The bar was opened in the early 1920’s and stayed in the Crosby family until 1987. Sara and I were fortunate enough to spend a good part of our teenage years living in Del Rio, the Texas town that borders Acuña, as a matter of fact that is where we met. Even after we married, we never missed a chance to go to Crosbys whenever we went back to Del Rio. 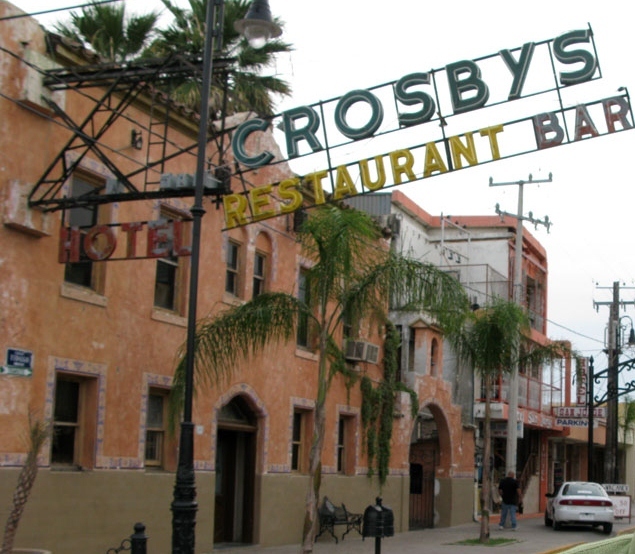 Everybody around there knows about Crosbys and in the days before 9/11, drug cartel problems, and bad press from the media local Texans would often go ‘’across’’ to shop, very likely ending up in Crosbys for a great meal and a few drinks. As a teenager I remember going to Acuña with my Grandpa and Grandmother (actually my step Grandmother, Nelberta) when they were in town from the ranch. Sometimes my parents were there and Mom and Nelberta would shop while grandpa found a cool place to sit and drink a cold beer. More often than not, it was at Crosbys. I remember well sitting there with him in the bar listening to the two old guys playing their guitars and singing. He would talk with them in Spanish and always requested that they play ‘’El Rancho Grande’’. I think it was probably in those days that I knew that someday, I’d live in México. Before we left he would always discreetly tip them very well. He told me that one of them had cancer and I got the feeling that he had known them for a good many years. I don’t ever remember hearing him refer to the lady that owned the place as ‘’Ma’’ Crosby, she was always Mrs. Crosby. And so it has always been with me. The Crosby family no longer owns the bar, Mrs. Crosby has been gone a number of years, the hotel was closed a long time ago, and as far as I know the bar and restaurant may even be closed due to the lack of business. But the building is still there, on the corners of Hidalgo and Matamoros in downtown Acuña. Maybe someday when the cartel situation straightens out and tourism picks back up, things can be back to normal. I’d like to take Sara there one more time. The picture below was probably taken sometime in the early 70’s. 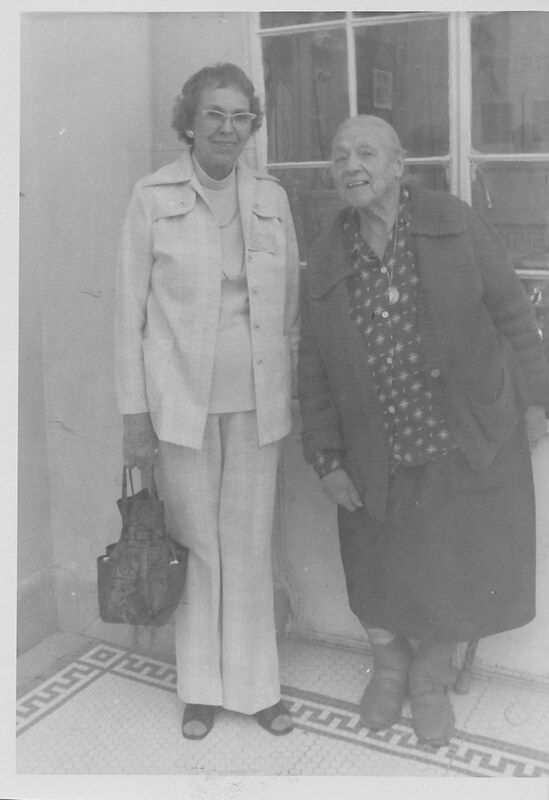 The lady on the left is my Grandmother Nelberta, and the lady on the right is Mrs. Lillian ‘’Ma’’ Crosby. Note: The photo of Mrs. Crosby belongs to my mother, The top photo is not mine, it was taken off the internet. Great post Dad, I remember going to "Ma" Crosbys several times as a kid and teenager with you and Mom. Hopefully when you take Mom back there you will let us tag along. Love the picture of Nelberta and Mrs. Crosby. I too remember Mrs. Crosby-but the one I remember best is Ester. She was the hostess for yrs in the resterunt. She even rode the bus over one time and we took her t the farm for the afternoon. My family went to Crosby's alot and when my momma passed away wegranted her request and had jalisco and Rancho grande played at her services. Great memories. Thanks Ashley, of course we'll let you tag along, not sure about Joe tho. Jeanette, You have a good memory and glad that Crosbys is special to you also. I don't remember Ester, I may have spent more time in the bar than the restaurant. I found a picture a few years ago of the 4 of us at Ma Crosby's not sure when it was taken before the song I know,I will try to find it and post it,I don't remember it being taken LOL. I went to Mrs. Crosby's in the late 40's. I was 7 or 8 yrs old. I went with my parents and saw the most wonderful "floor show" Still remember it vividly today and a beautiful courtyard. Wish I had a picture. I well remember Mrs. Crosby's,which was how everyone I knew in San Antonio called it.Even stayed in the hotel in the early 70s...lovely, big rooms , immaculate, and the car was parked in the courtyard. Good memories. I hope it is still in business.